Why I Live in Minnesota, Part II | So Many Exciting and Beautiful Places! Our extended family has the good fortune of owning a “cabin” on Gull Lake in north central Minnesota. The lake is almost 15 miles long, and is about 15.5 square feed in area. Our place is on North Gull, one of eight connected lakes in the chain. There was a pretty violent storm four weeks ago, and several properties on the middle and southern ends suffered damage to boats, lifts and docks. Thousands of trees were lost, and several resorts were forced to close due to property damage and power outages that lasted up to a week. 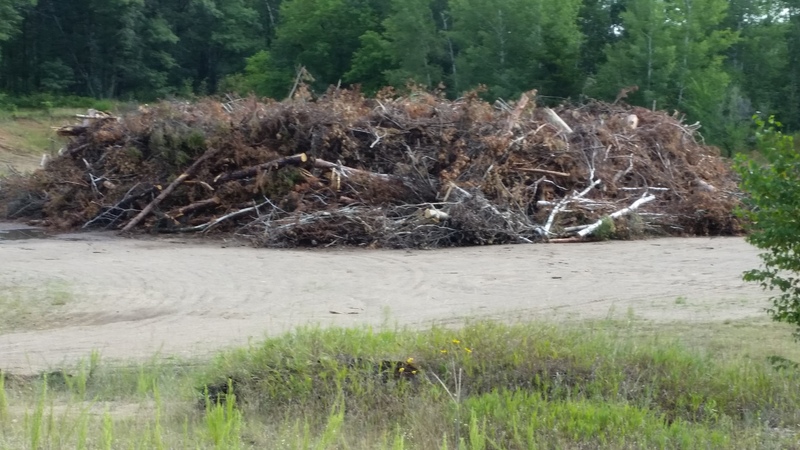 Cleanup work is still occurring, and there are several sites with large log and brush piles. One of many brush and log piles following July’s storm. Fortunately, there was no damage here, and there has been no letup in use by various family members. We are conveniently located close to two towns with great shopping opportunities. My husband isn’t coming until tomorrow, so I spent some time in Nisswa, home of some Pretty Good Shopping. It’s always worth a trip to town, at least for me. Mark came up today, and we spent the day relaxing and enjoying the beautiful day. 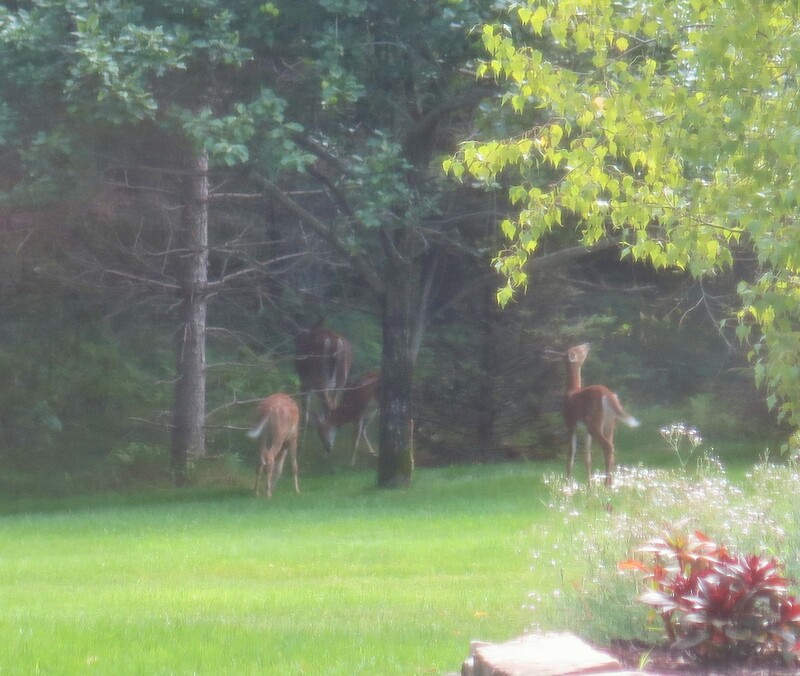 At one point in the morning, we saw a doe and three fawns in the yard, feasting on green apples from a tree near the house. They had already eaten all of the hostas to the ground. They’re fun to look at, as long as they aren’t eating my flowers at home. Difficult to see, photo shot through screen. After dinner, we watched an old movie, “Miracle,” about the 1980 Winter Olympics team that beat the Soviet for the first time in 20 years, and went on to win the Gold Medal. Although it was 35 years ago, I still remember the excitement of those games. Even now, I was on the edge of my seat watching the movie. Herb Brooks, the coach, later coached the SCSU hockey team, and I had the good fortune to attend several of their games. A gorgeous day on the lake, and we took the boat out for a few hours. We stopped at Bar Harbor, which is a short boat ride away. They have a couple of young people at the docks to help customers tie up their boats, a much appreciated service. We enjoyed drinks and lunch on their patio before heading back. The restaurant offers some delicious entrees for dinner as well. Mark headed home today to monitor some landscaping projects and protect the homestead from rabbits and deer. They do love our gardens. 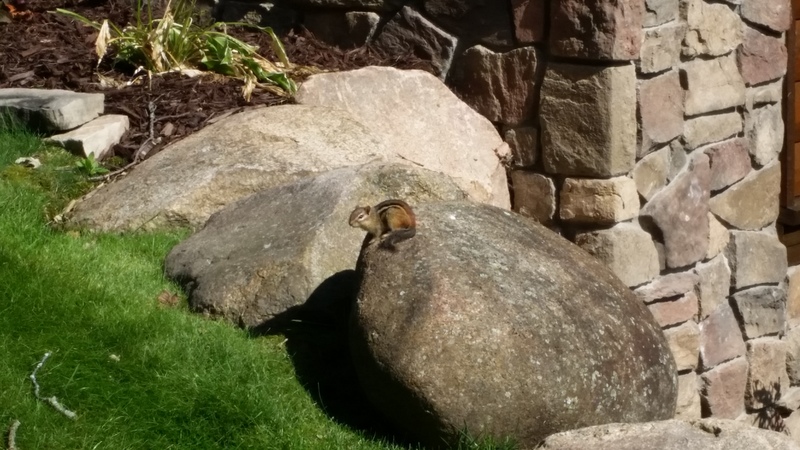 Chipmunk waiting for me to go away. My book group members came up later in the day for our annual weekend gathering. We spend the time reading, talking, eating, and discussing our books. And, yes, there is some shopping as well. This group has been meeting for 30 years, and are some of the best friends I could ever hope to have. Several of us met for lunch at a newly opened brew bub in Nisswa, Bad Axe Brewing Company. The day was rainy, so downtown was very busy, and the restaurant was full. The sandwiches were delicious. Didn’t try the beer, but it’s probably good as well. By dinnertime, a few more were here, and we went to Ernie’s on Gull for dinner. Ernie Ritari, a Finnish immigrant, started a camping and fishing resort on this location in 1917. He rented out boats and hosted community pig roasts. It’s no longer owned by the Ritari family, but is still a family-friendly establishment with a full service marina and live music on the weekends. The food is pretty good as well.